We use official intervention data provided by the Federal Reserve and, recently, the Japanese Ministry of Finance, as well as a new data set based on Reuters news articles on intervention that is perceived by FX traders. We estimate probability density functions (PDFs) from option data to describe market expectations. We find that, between 1993 and 1996, Japanese authorities tended to respond mainly to deviations of the exchange rate from some implicit target levels and to a rise in market uncertainty. Between 1997 and 2000, the Bank of Japan mainly reacted in response to higher uncertainty. On the other hand, the Federal Reserve intervened only in cooperation with the Bank of Japan. We find that intervention had no statistically significant systematic effect on the mean of yen/dollar expectations. Consistently, we detect no evidence that intervention systematically altered market participants’ bias between a stronger and a weaker dollar with respect to the forward rate. Contrary to most findings of the literature, we fail to find evidence that intervention was associated on average with higher exchange rate variability. Finally, we find that intervention was not followed by an increase in the tails of the distribution of exchange rate expectations. The consensus view is that sterilized intervention can be effective if it is announced publicly, coordinated across central banks, and most importantly, consistent with underlying fiscal and monetary policies. As we are able to control for public announcement and central bank coordination, our findings suggest that intervention during our sample period was not consistent with underlying fiscal and monetary policy and therefore had little influence on market outcomes and expectations. 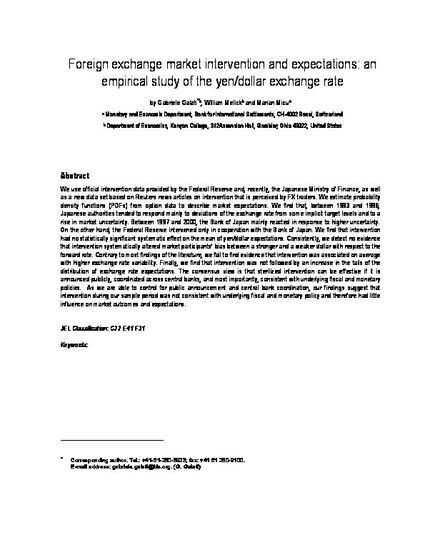 "Foreign exchange market intervention and expectations: an empirical study of the yen/dollar exchange rate ", with Gabriele Galati and Marian Micu, Journal of International Money and Finance, 24, October 2005, pp. 982-1011.